The complete edition is almost here! The Kickstarter campaign has gone live and is over 50% funded as of today! There are still over 3 weeks left to pledge and a lot of cool extras to get your hands on! Be one of the first to get this book, click the link below! I quick tease for a new piece of Rander art. Working on cover ideas for the complete edition coming out very soon! 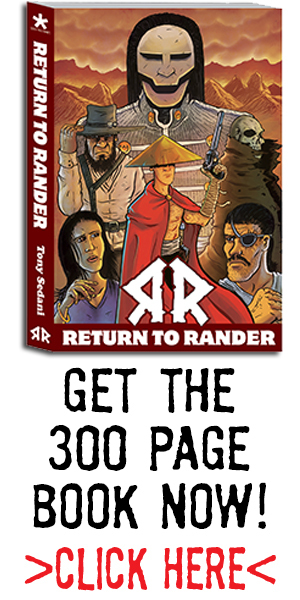 The final artwork for the upcoming “Complete Edition” of Return to Rander is all done. The post production is underway and here is a snippet of a page. Someone is back? So, as I mentioned last edition, there is a new mini comic coming in a few weeks of Return to Rander entitled “Enter the Devil”. This will be part of the Stockpile Comics EP mini comic line. It will be numbered EP02 and this will be the back panel of the book. This is a cool video showing how I colored it. Enjoy! Sketch cover of Star Wars #1. I’m sure i’m not the first one to come up with this idea. Used my brush pen and white gel pen on this. Used Action figure as reference.